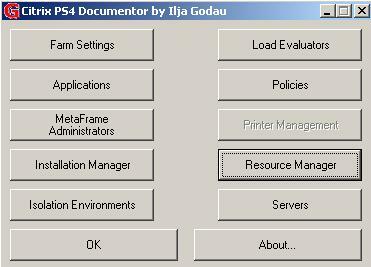 The PS4 Documentor tool is a single executable. Together with the executable Ilja delivers also the mfcom.dll. Ilja is using Citrix default MFCom commands to query the Citrix datastore to document the settings. The executable and the dll need to available in the same directory on a Citrix Presentation Server 4 system. The tool uses the logged in user to create the reports, so the account need to have enough rights within the Citrix Console and on the server. By double clicking the executable on the Presentation Server the tool is started. The simple but effective interface is displayed. 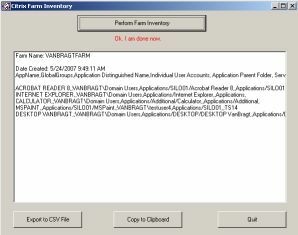 For most components available within Citrix a button is available like Farm Settings, Applications, Load Evaluators, Policies and Servers. By clicking the corresponding button the settings are exported. The application is not displayed a progress bar, so you need to wait patiently before a window is displayed mentioning that documentation is done. Only one component can be documented per time, so you have to push the buttons one by one. As already mentioned the tool is using MFcom for gathering the settings. 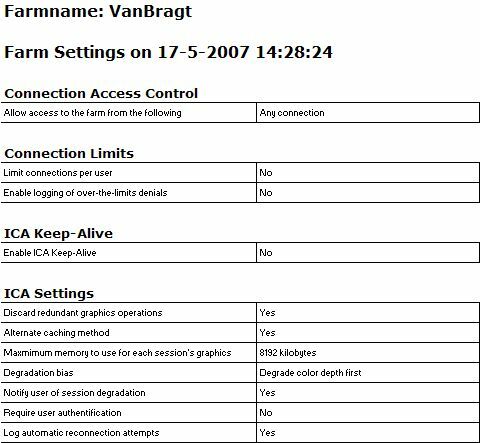 Unfortunately MFcom does not support gathering of these settings, so also this tool can not document your configuration. This part applies to Installation Manager, Resource Manager and some other smaller subsets of the other components. The settings are document in HTML format, but can easily be copied to other products like Word. Personally I find the lay-out very readable. Leonardo just released this tool in May 2007. Also this tool exists of one single executable. For convenience the used DLL is also delivered with the download if you do not have the DLL on your server. Logically this tool is also using MFCom so preferable you should run the tool on one of your Citrix Presentation Servers. The interface is very simple. You only need to click on the button Perform Farm Inventory and after some time the results are displayed within the tool. The inventory can be copied to the clipboard or saved to a CSV file. At this moment the tool only queries the Published Applications settings. Documenting the Citrix settings is a time consuming job. Therefore any help that is available for these activities is wonderful. At the moment the PS4 Documenter is the best available freeware tool that can you help with this. Mostly because MFcom does not support exporting some settings, still some manual actions are needed. Also the interface is a little simple, but it is definitely a very useful tool for make your documentation tasks easier. Unfortunately the Citrix Farm Inventory only queries the Published Application settings. Therefore the other settings should be documented manually and makes this tool less useful than the PS4 Documentor. A plus is that the tool can be used for more versions of Citrix Presentation/Metaframe Server.